Why Budapest? Ten Reasons You Need To Visit! As it turns out, writing a travel recap nearly four weeks after we were at said destination is very difficult for me. 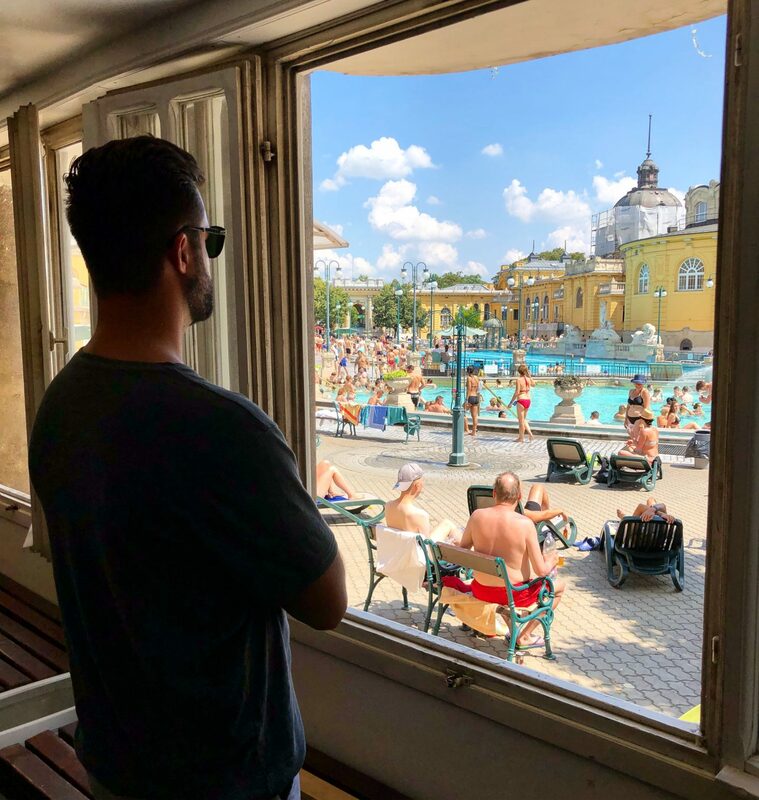 But I would feel an immense amount of blogger guilt if I didn’t write a Budapest post because there are thousands of photos just sitting on my phone waiting to be shared with the world! And what am I supposed to do? Just NOT SHARE THEM? No, I wouldn’t. I couldn’t. And also because Budapest is wonderful and I feel like more people need to know this. Or maybe this isn’t news to you? Maybe I’m just the last to find out. Before going there, the most I knew was that it’s Harlow’s homeland (he’s Hungarian) and George Ezra has a house there. The nightlife is insane. Way too insane for my old tired bones, but the kids (twenty year olds) really seemed to enjoy it. We took a night cruise on the Danube (which was actually more like a rager-club-party-cruise) and even though I was wildly uncomfortable for most of it, I could still appreciate the fun being had by others. I would suggest a night cruise down the Danube, just not the specific one we were on. I would also suggest heading to the Ruin Pubs, which are exactly what they sound like. Pubs set in crumbling old (ruined) buildings. This post describes them better than I ever could. Margaret Island is an absolute dream. We watched a water fountain show (cooler than it sounds, I swear. I had no idea dancing water could make me tear up… but there I was.) Then we rented bikes and rode around the beautiful island, stopped for drinks on the river, and made friends with new Vizslas. Ahhh it was so much fun! I hate to be cliche, but TAKE ME BACK. And then Helene pulled out two pages of very detailed, very well researched, notes she and Michael had made. But did you see my notes, Helene? And that is why she is a professional travel blogger, my friends. On the first day together with our new travel partners, we ventured to the baths. And those were something else… On the outside it looks like a couple of fancy pools, but when you walk into the actual bath houses, you’ll see it’s so much more. It’s rooms and rooms of BATHS. Big baths, small baths, man baths, woman baths, sauna baths, bath baths, beer baths, the list goes on and on. We went to the most popular bath, Széchenyi thermal bath, because we were tourists so it made the most sense. Chris reminds me of Clark Griswold here. Anyone else see it? And that’s my hot take on Budapest. Have any questions? Let me know! Next up: PRAGUE! Coming in six months. Or tomorrow? Who knows? I’m a roll now! Previous Post: « Why I Started Blogging. Why I Continue. I've been blogging for 87 years now. Crazy! Time really does fly when you live life on the internet! But anyway, have you met my dog? He's awesome!